300mm (12") x 22mm bore. 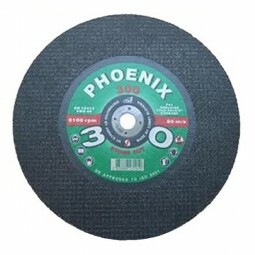 The PHOENIX 300 is one of the best value 12” discs available in todays market. A hard wearing, durable blade with a completely revised specification to cope with the modern day stresses of the construction and engineering industries. Manufactured to VBG49 safety standards and MPA10203.